The inner diameter of a well can be stored in DT_WELL_SEGMENT.INNER_DIAMETER and the corresponding unit in DT_WELL_SEGMENT.DIAMETER_UNIT. The SEGMENT_TYPE field is set to SOLID_WELL_RISER in EDGE, but it can be remapped using the remap tables. See Associating Well Segment Ref Values with Well Installation Form to view information on mapping segment types in EDGE. 1. Run the “EDGE Field EDD” Report to create an EDD for the field crew. 2. 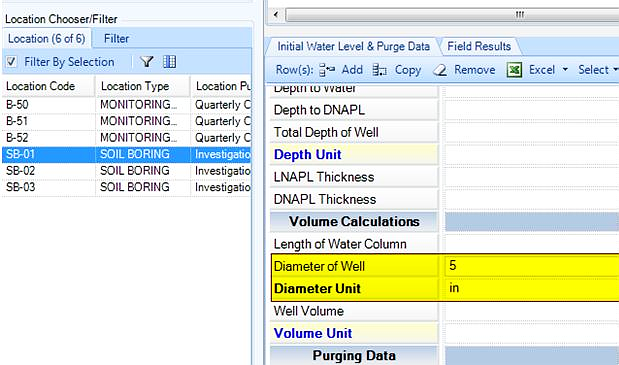 Select "Segment Type for Well Diameter" input parameter. 3. This will export the inner diameters from DT_WELL_SEGMENT into the EDGE EDD. Open EDGE and choose a location, select a field sample, and click the Add on the “Initial Water Level & Purge Data” form. Both “Diameter of Well” and “Diameter Unit” will be populated. See the image below.